A One Place Study (as opposed to the genealogical work of an Online Parish Clerk or the worldwide surname reach of a One Name Study) focuses on the history of a specific place. By ‘history’, I don’t just mean dates and events, but also its social history – the people who lived there and what they did for a living. A place’s history can also include maps and picture postcards, details of the names on the war memorial, how it appeared in the Domesday Book, and more. 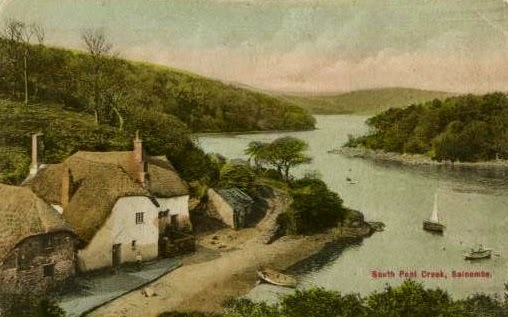 The OPS for South Pool in Devon, England includes the hamlets of North Pool and Frogmore, and has been registered with the Society for OnePlace Studies and the Register of One Place Studies. I know, I know. It seems rather redundant. I have a Blogger blog, have pointed my own domain at it (so it seems like a website) - and then put a tab for blog posts in the background. Why? It's a matter of priorities. Do you want a blog or a website? I wanted a website, but couldn't afford yet another one, so I went with a FREE Blogger blog (ooh, I do like that word). If you want to post daily posts, then you want a blog (and you can put half a dozen static pages down the side). If you want the focus to be on the static pages, not the blog posts, then you want a website. So I logically ha ha created a Blogger blog. In order to make it look like a website, I bought my own domain name and 'pointed' it at the Blogger blog. I wrote one post, which was the welcome post, and instructed Blogger to show only one post per page. Then I wrote lots of static pages, which were listed down the side. Boom! a website is born! But as the One Place Study has progressed (and I did this for the Blagdon Surname Study blog-website, as well) I wanted to keep a record of the things I have done, so that I can look back later and say "Ah! that's how I did it!" - and when. So I wanted a blog. Except, it already was a blog. Except, it wasn't. So I plunged into the world of redirects and fancy searches. This is a lot easier than it sounds. You create a blank Page called 'Blog', and a test Post called 'test post'. Every Post that you want to appear on the Page, you put the label 'blog' on it. Tip: don't forget the / in front of each bit. And now you have a blog inside a blog/website!